Os Pagodeiros play samba classics, old and new. Named after the intimate gatherings of musical colleagues who love to play the festive repertoire of the pagode or samba de raiz style, Os Pagodeiros lights up any party with their percussive and highly infectious music. The word pagode ("pah'goh'djee" ) was once referred to as a party in the slave dwellings of the Brazilian plantations, but by the end of the 70's it had adopted another meaning: a type of party, popular in the favelas (slums) of Rio de Janeiro, where friends and neighbours gathered in their backyards, shared food, copious amounts of drink, recounted stories of the ups and downs of daily life and, naturally, played lots of samba. The word today has two meanings: a type of party and a type of music. Pagode has developed into a specific genre of samba; specific percussion instruments have been invented (the banjo, tantam, repique de mao, are examples); common poetic themes of skullduggery and hardship are often cited; characteristic singing styles; and lots of improvising. Those who play pagode are referred to as "pagodeiros". Those who don't appreciate the art form often use the word pejoratively to refer to the ne'er do wells of society. And Os Pagodeiros in Toronto is certainly not a group of ne're do wells by any means (at least we hope not)! 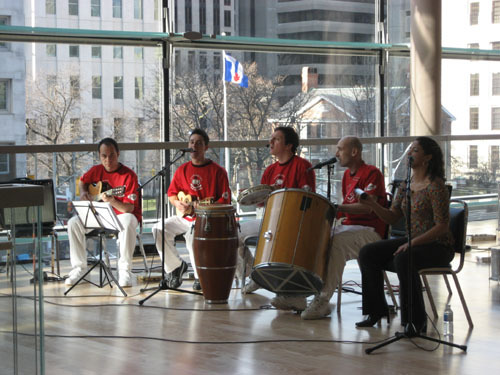 They are members of the Escola de Samba de Toronto's musical community, who are well versed in the style, and have recently joined together to bring a festive sense of pagode to the city.